Not too many pets love taking pills, and with good reason. Many medications taste just awful, especially Tramadol, a common medication for new amputees. If your pet has made it clear that certain medications are just unacceptable, you’re going to need to get creative about giving them. 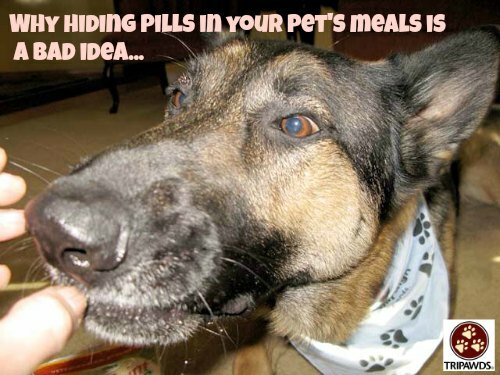 Whatever you do, never hide pills in your pet’s regular meals. 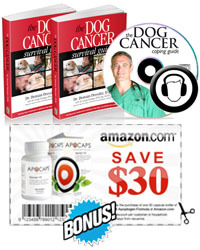 Your pet may associate their food with the taste of pills and go on a hunger strike. That’s the last thing you need. As you can see below, we found a ton of commercially-made pill pastes and wraps that will keep your Tripawd from getting too used to your pill disguises. The only issue we can see with the following products is that the ingredients aren’t exactly health-conscious. Many include controversial ingredients, including preservatives like BHT or corn syrup for flavoring. This is not great when you’re aiming for a low-glycemic, anti-cancer diet for your Tripawd dog or cat. On the other hand, as long these pill masks are given in small quantities, one can assume that the overall benefits of the medications are greater than the small risk these ingredients pose. Sometimes you gotta do what you gotta do to get your dog or cat to take pills. Always be conservative about using these pill wraps.